Escabeche is a typical Mediterranean cuisine which refers to a dish of either poached or fried fish (escabeche of chicken, rabbit or pork is common in Spain) marinated in an acidic mixture before serving, and to the marinade itself. The dish is common in Spain and Latin America, and popular in Catalonia, Portugal, Provence and the Philippines. Influences of the dish appear as far as Asia-Pacific with adjustments to local food staples. It is usually served cold after marinating in a refrigerator overnight or longer. The acid in the marinade is usually vinegar, but can also include citrus juice. Escabeche is a popular presentation of canned or potted preserved fish, such as tuna, bonito or sardines. In the New World, versions of the basic marinade are often used with other foods than fish and meats, for example green bananas and chicken gizzards (Puerto Rico), jalapeño peppers (Mexico), etc. The origin of the word escabeche is Persian, and was brought to Spain by the Arabs during the Moorish conquests. The word derives from al-sikbaj, the name of a popular meat dish cooked in a sweet and sour sauce, usually vinegar and honey or date molasses. This is the Philipino version. Fish: Use a large frying pan and put enough oil to cover the bottom with about 1/4 inch. Pan fry the fish in the oil on medium heat. If you are using a fillet start with the flesh side down. You may need to score the skin of a whole fish in order to allow it to cook through. Once the fish is fully cooked set aside some of the cooking oil and arrange the fish on a serving plate. Stir the water, vinegar, soy sauce, sugar, salt and pepper/pepper corns together in a mixing bowl. 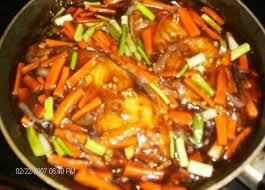 The mixture should have a strong flavor of balanced sweet, sour, and salty. Add additional sugar, vinegar and/or soy sauce until you achieve this balance. Saute garlic in the reserved oil in a wok on medium-high heat until golden. Add onion and saute until it is also golden. Add ginger and saute until flavors blend. Add carrots, stir briefly then add liquid mixture. Mix sauce until flavors blend nicely. Taste again and re-balance the flavors. Add bell pepper and corn starch mixture and stir together. Simmer until reduced to about a cup. Ladle the sauce over the fish and serve.